Quiet Country Studio with distant ocean views. Gated community. Property 51: Quiet Country Studio with distant ocean views. Gated community. Property 60: Steps to Beach Park, swim with the turtles, minutes to drive to restaurants. Property 62: Lava Apartment in Paradise! Anthurium Hideaway 30 min from Volcano Nat. Park! 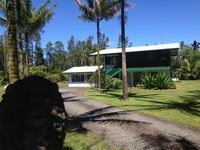 Property 63: Anthurium Hideaway 30 min from Volcano Nat. Park! I spent two nights in the adorable cottage in the rain forest. The property is beautiful and meticulously maintained by the owners. Very clean and inviting. So many different types of trees and flora will keep you mesmerized. I could not stop taking pictures. This place is so quiet and secluded that all you can hear at night is the falling rain in the trees and sounds of the critters in the forest. The owners/hosts were so friendly and wanted to make sure that everything was to my expectations. They were so gracious and willing to share their stories of living on the island and provided me with useful information about the area and what to do. 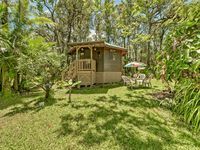 Located between Hilo and Volcano this location makes it easy to get to anywhere on the east side of the island in minutes. I would definitely stay here again and would recommend to anyone looking to experience what it is like to live in the jungle!